Many shooters are not aware of the dramatic effects that bullet seating depth can have on the pressure and velocity generated by a rifle cartridge. COAL is also a variable that can be used to fine tune accuracy. It’s also an important consideration for rifles that need to feed rounds thru a magazine. In this article, we’ll explore the various effects of COAL, and what choices a shooter can make to maximize the effectiveness of their hand loads. Most loading manuals (including the Berger Manual), present loading data according to SAAMI (Sporting Arms and Ammunition Manufacturers’ Institute) standards. SAAMI provides max pressure, COAL and many other specifications for commercial cartridges so that rifle makers, ammo makers, and hand loaders can standardize their products so they all work together. As we’ll see later in this article, these SAAMI standards are in many cases outdated and can dramatically restrict the performance potential of a cartridge. Bullet seating depth is an important variable in the accuracy equation. 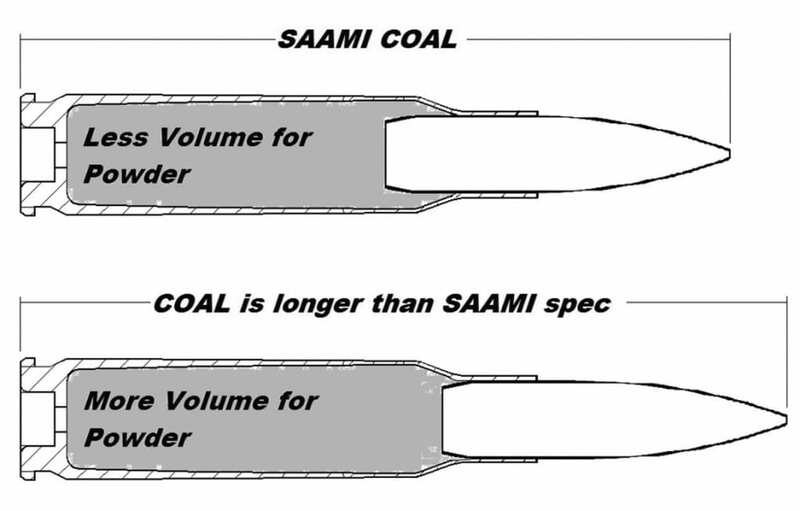 In many cases, the SAAMI specified COAL is shorter than what a hand loader wants to load their rounds to for accuracy purposes. In the case where a hand loader seats the bullets longer than SAAMI specified COAL, there are some internal ballistic effects that take place which are important to understand. Figure 1. When the bullet is seated farther out of the case, there is more volume available for powder. This enables the cartridge to generate higher muzzle velocity with the same pressure. The primary effect of loading a cartridge long is that it leaves more internal volume inside the cartridge. This extra internal volume has a well known effect; for a given powder charge, there will be less pressure and less velocity produced because of the extra empty space. Another way to look at this is you have to use more powder to achieve the same pressure and velocity when the bullet is seated out long. In fact, the extra powder you can add to a cartridge with the bullet seated long will allow you to achieve greater velocity at the same pressure than a cartridge with a bullet seated short. When you think about it, it makes good sense. After all, when you seat the bullet out longer and leave more internal case volume for powder, you’re effectively making the cartridge into a bigger cartridge by increasing the size of the combustion chamber. Figure 1 illustrates the extra volume that’s available for powder when the bullet is seated out long. Before concluding that it’s a good idea to start seating your bullets longer than SAAMI spec length, there are a few things to consider. The chamber in a rifle will have a certain throat length which will dictate how long a bullet can be loaded. The throat is the forward portion of the chamber that has no rifling. The portion of the bullet’s bearing surface that projects out of the case occupies the throat (see Figure 2). Figure 2. Chamber throat geometry showing the bullet jump to the rifling or lands. 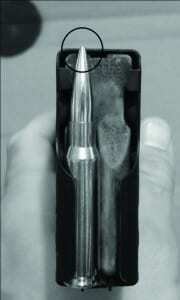 The length of the throat determines how much of the bullet can stick out of the case. When a cartridge is chambered and the bullet encounters the beginning of the rifling, known as the lands, it’s met with hard resistance. This COAL marks the maximum length that a bullet can be seated. When a bullet is seated out to contact the lands, its initial forward motion during ignition is immediately resisted by an engraving force. Seating a bullet against the lands causes pressures to be elevated noticeably higher than if the bullet were seated just a few thousandths of an inch off the lands. A very common practice in precision reloading is to establish the COAL for a bullet that’s seated to touch the lands. This is a reference length that the hand loader works from when searching for the optimal seating depth for precision. Many times, the best seating depth is with the bullet touching or very near the lands. However, in some rifles, the best seating depth might be 0.100″ or more off the lands. This is simply a variable the hand loader uses to tune the precision of a rifle. Figure 3. Illustration of a bullet being seated out of the case too far to feed thru a magazine. When a hand loader is working to establish a seating depth to use with a particular bullet, he must decide if he needs the cartridges to feed thru a magazine or not. If the shooting application is hunting or tactical shooting, then the shooter probably needs the rounds to cycle thru the magazine so the rifle can be used as a repeater. However, in many slow fire target shooting applications, it’s not necessary to magazine feed the cartridges. Often times when a shooter doesn’t need to feed rounds thru a magazine, the shooter can take advantage of substantial performance improvements by loading the bullets out long. This brings up an important reality of seating depth and COAL. It is a fact that the ballistic performance of modern ammunition is directly limited by the SAAMI COAL standards that are currently in place and that rifle manufacturers build to. Even when a shooter understands the implications of cartridge case volume and has a chamber that allows them to load the rounds out long, the rifle itself (having been built to feed SAAMI length cartridges) won’t allow the shooter to do so. This fact is one reason for the popularity of custom rifle builders who understand the importance of feeding longer than SAAMI length rounds and building rifles with long enough actions and magazines to cycle the rounds. The first commercial rifle manufacturers who figure this out and start building rifles capable of feeding longer rounds will lead the way into modern times. There have been many improvements to several key components of modern rifle ammunition, specifically bullets and powder. It’s unfortunate that many rifle makers continue to adhere to the antiquated SAAMI limitations that were put in place so long ago when components were so different, standards which limit the performance of modern potential. – Seating a long bullet to the restrictive SAAMI COAL can severely decrease the internal volume of the cartridge which will limit the max velocity the cartridge can achieve. – If magazine feeding is not a requirement (or if you have a longer than standard magazine) you can load your bullets long, which increases the volume for powder and allows you to use more powder and achieve faster MV for the same pressure. – If you load the bullet too long and it encounters the lands, this can elevate pressure due to the engraving force resisting the bullets’ initial forward motion. The second half of this article will discuss the differences between Cartridge Over All Length (COAL) and Cartridge Base To Ogive (CBTO), and why a working knowledge of both is beneficial to shooters and reloaders.